We showcased most of our simulators including revolutionary G-DOME. IN JANUARY AND FEBRUARY, GUARDIARIS ATTENdeD TWO OF THE BIGGEST FAIRS IN THE INDUSTRY. Guardiaris showcased a wide range of simulators. GUARDIARIS PRESENTED WIDE RANGE OF SIMULATORS INCLUDING OUR LATEST INNOVATION GUARD DOME. In December, Guardiaris hosted Military attachés from over 35 countries on a presentation of our innovative products. The main attraction was 12-meter Guard Dome simulator, which showcased Guardiaris' latest product based on our newly developed and patented technology. We were able to present our best in class simulators to Military attachés from around the world. Guardiaris presentation for members of Slovenian MOD. In October, Guardiaris held a special presentation event for selected members of MOD. The event was a showcase of a wide range of Guardiaris innovative solutions and the participants were able to try all of the simulators for themselves. It was a good opportunity for guests to see the importance of simulators and their endless training possibilities. 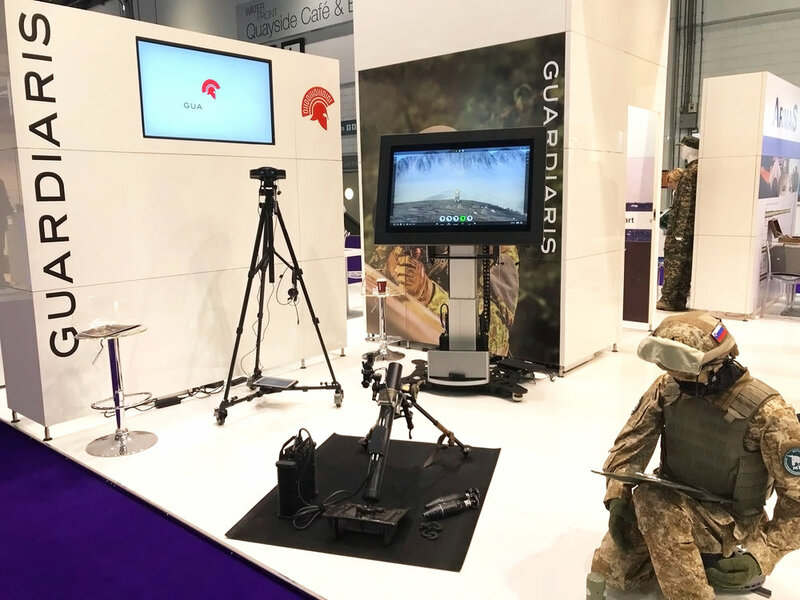 GUARDIARIS COMPANY HAS BEEN PRESENTING REAL TIME SIMULATION TECHNOLOGY AT EUROSATORY 2016. Guardiaris exibit on ES 2016 based on invitation of Slovenian MOD. Company stand was a part of Slovene Defence Industry pavilion, where MANPATS RGW90 Simulator, SAS-S as FN Herstal's SCAR, RWS-S, and our latest development Forward observer Trainer and Mortar Simulator were presented. All listed simulator systems were interconnected into a unique real-time VR environment running simultaneously on proprietary engine in a common training scenario and were controlled via Guard Control Desk. Based on visitors responses Guardiaris proved their vision of MOBILE TRAINING SIMULATION future. Guardiaris Effector 90 and FO-T simulators under the brand name DynaSim were also presented on a Dynamit Nobel Defence stand, which was visited by many delegations from all over the world. Training and simulation for the MANPATS family as »State of the art simulation systems« were successfully performed. Croatian company DOK-ING has been also exhibiting Guardiaris innovative solutions and endless training possibilities on a demining vehicles MV-4 and XLPD. Presented solutions received from customers no other but the positive feedback all confirming that training is not a cost, it's an investment into the future. GUARIDARIS TRAINed THE BRAIN AND WILL CONTINUE TO DO SO!